1996. Clayboard. 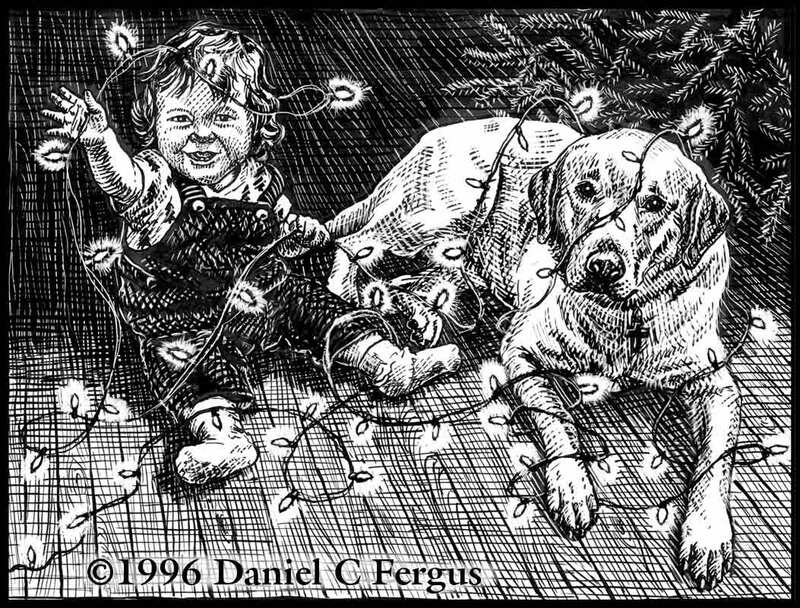 8" x 6"
From 1990 to 1995 I had drawn an annual Christmas card that featured (with one exception) fictional children involved in some sort of holiday tradition or activity (pageants, mistletoe, manger scenes, etc.). But in 1996 I had something new to play with—an actual child in my life, my daughter Rachel. I made the decision to draw her, marking the first of many times that a child of mine would appear in one of my works of art (and not just Christmas card art). I also included our dog Loki, who was a year old at the time, and would make one more appearance on a Christmas card in 2005. This card drawing differs from all of the others in the Christmas card series in two significant ways— the medium is clayboard, not just pen and ink, and the card’s orientation is horizontal, not vertical.